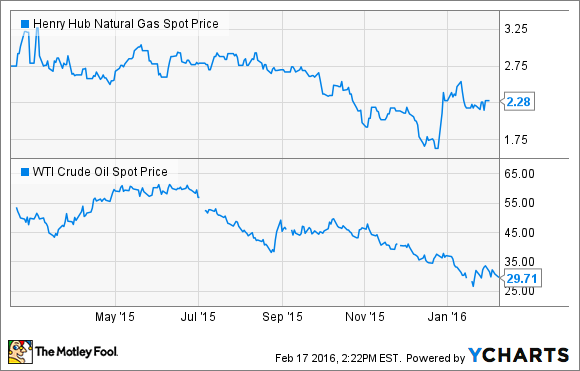 Earnings, guidance, and a downgrade are weighing on the energy midstream company. What: Shares of EnLink Midstream (NYSE:ENLC) and its MLP EnLink Midstream Partners (NYSE:ENLK), as well as its largest shareholder Devon Energy(NYSE:DVN), all slumped today after the group reported fourth-quarter earnings after the market closed yesterday. EnLink Midstream bore the brunt of investors' displeasure, with its units slumping by more than 16% by 2:30 p.m. EST on Wednesday. So what: EnLink Midstream, which is the general partner of EnLink Midstream Partners and majority owned by Devon Energy, reported fourth-quarter cash available for distribution of $47.8 million. That was down from last year's fourth quarter when the company reported $66.3 million in cash available for distribution. The decline was primarily due to an asset drop-down transaction with EnLink Midstream Holdings to the partnership in 2015. Further, despite the decline, EnLink Midstream's distribution coverage ratio was 1.04 times, which was adequate. The company needs to see prices improve just to be able to maintain its current distribution rate without paying out more than it brings in. Further, a much bigger rally in commodity prices is needed in order for it to increase distributions in 2016. Neither bodes well for EnLink Midstream, because its distribution is reliant on cash it receives from its MLP. This lack of growth caused both companies to be downgraded by Bank of America, from neutral to underperform, which also weighed on the unit prices. That unit-price weakness, along with its own guidance, weighed on Devon Energy's stock, too, because it has a big ownership stake in EnLink Midstream. Now what: Industry conditions are pretty challenging right now, and that's evident by the tight outlook EnLink has for 2016. Because the company needs much higher commodity prices just to maintain the status quo, investors are worried that both companies could reduce investors payouts in the year ahead in order to keep their balance sheets strong. That wouldn't be too much of a surprise considering that primary shareholder Devon Energy just slashed its dividend 75% in order to protect its own balance sheet.